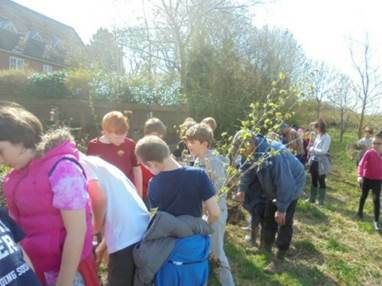 Seed to Tree, 'S2T' is our flagship project with St Cuthbert's Primary School. Each year in the autumn the Y1 children look for tree seeds, plant them in the tree nursery at school and nurture them until the saplings are strong enough to plant out in the Wild Spaces in and around Great Glen. 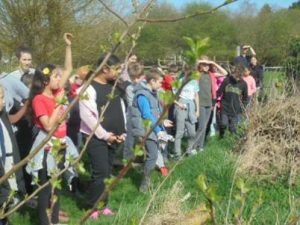 In early 2015 the first group of children went to Burton Brook WildSpace and planted out the trees that they'd nurtured from seeds sown when they were 5 years old. 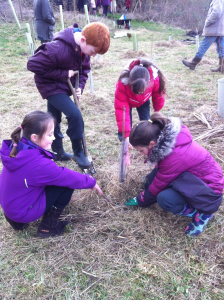 Planting the trees allowed the children to contribute to improving the environment and help to combat climate change. Since then the trees have grown rapidly and some are now 9 or 10 feet high. 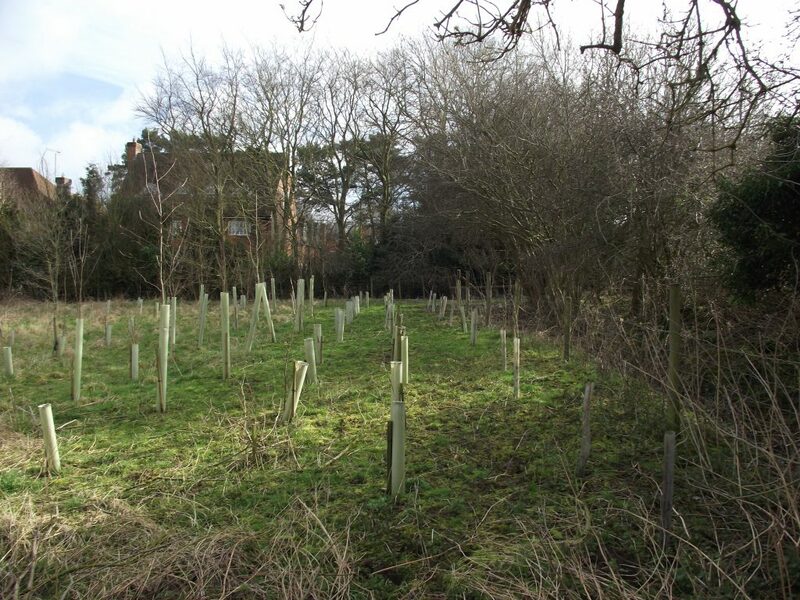 We now have a spinney of over 50 trees including oak, ash, hazel and other species. This was taken in early April 2017. A few weeks later the trees were in leaf and growing up. We try to ensure that the young trees are kept clear of weeds at the base and add mulch to help water retention. 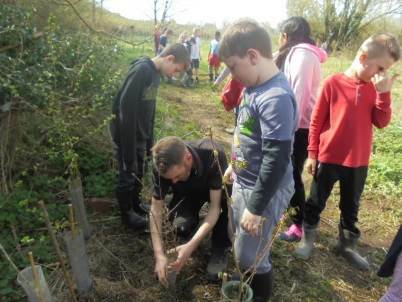 After a delay of several weeks due to persistent rain we finally planted this year's young trees out with the help of year 5 and 6 children on 17th April. 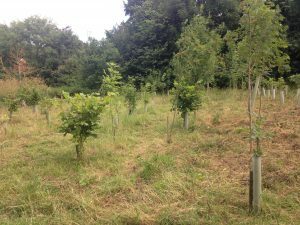 We planted hazel, oak and several other species. The tree has to be planted at the correct depth of soil or it will not grow. We had to identify where the join between the stem and the roots are and then make sure the soil level was as close as possible to that. the roots were spread out and the soil carefully refilled back around them. 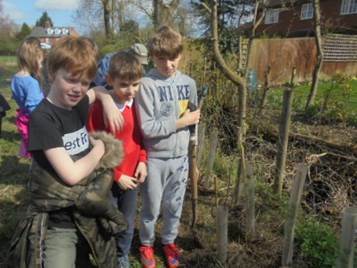 Here the group is busy planting the new trees, working in groups of three or four. We planted 15 trees altogether at this site. Then there was a question and answer session about why it is important to have green spaces and how trees contribute to the environment. Planting finished, tree guards on and mulch round the roots! We're now looking forward to seeing the saplings take root and grow!